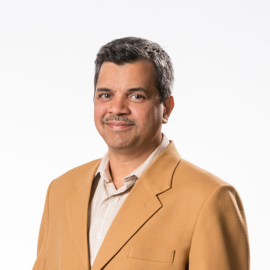 Milind Naphade is the chief technology officer of AI Cities at NVIDIA, where he leads technology strategy for the company’s Metropolis platform. Previously, Naphade held executive and leadership roles at Cisco and IBM. As the director of the Cognitive Systems Organization at Cisco, he built a team focused on machine learning, natural language processing and AI. In his 14 years at IBM Research, he led several strategic AI initiatives in multimedia analytics and smarter planet solutions. Over the past two decades, Naphade’s pioneering work has resulted in 15 AI products and applications, 140 publications and patents, five industry awards, nine corporate awards, and four best paper/thesis awards. Naphade holds a Bachelor of Engineering in instrumentation and control from the College of Engineering Pune and an M.S. and Ph.D. in electrical and computer engineering from the University of Illinois at Urbana-Champaign.